CINCINNATI (AP) Andy Dalton moved a little stiffly as he walked through the locker room on Monday, showing the effects of another tough day that’s now the norm for the Bengals quarterback. The Bengals (3-4) know they have to protect Dalton much better to have any chance of getting back into the AFC North race. Up next: Road games three straight weeks against Jacksonville, Tennessee and Denver. Dalton was under steady pressure again during a 24-23 win over Indianapolis on Sunday. A struggling offensive line repeatedly allowed the Colts to blitz up the middle unblocked, forcing Dalton to get rid of the ball while taking another direct hit. He was sacked three times in the fourth quarter and spent a lot of time avoiding the rush. Dalton has been sacked 22 times in seven games, putting him on pace for the first 50-sack season of his seven-year career. 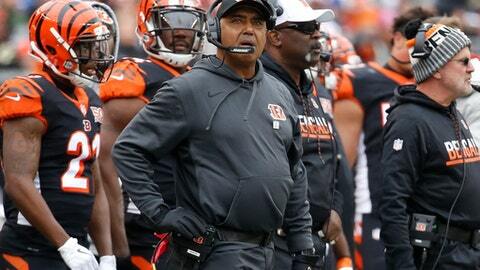 ”We just have to keep making sure that everyone around him is playing up to his standard all the time,” coach Marvin Lewis said Monday. They survived a game that could have ended their aspirations of catching the Steelers (6-2) atop the division. Defensive end Carlos Dunlap deflected a pass , caught it and ran 16 yards for a touchdown in the fourth quarter, deciding the game. They’re not at all happy with the offense’s inconsistency, due in large part to the offensive line’s breakdowns. The Bengals have one of the worst running games in the league, hitting a new low in the victory over Indianapolis (2-6). Cincinnati managed only 58 yards rushing, including 10 yards on Dalton’s scrambles and 14 on a carry by receiver Alex Erickson. The three running backs combined for only 34 yards on 17 carries against a defense that was ranked second-to-last in the league in yards allowed. Bill Lazor took over as offensive coordinator after an 0-2 start and has been making changes to try to get more out of the running game, with little result so far. Often, running backs are tackled soon after taking the handoff – five running plays lost yards on Sunday. ”Bill is putting things together a little differently and there’s adjustments we’re making, and we’re having to do them on the fly,” Lewis said. Lewis disagreed with a 15-yard penalty on Carl Lawson for roughing the passer late in the first half. The officials decided Lawson landed on Jacoby Brissett with his ”full weight” after a pass was released. Lewis made his case with referee Jerome Boger at halftime. Lewis was noncommittal about whether first-round pick John Ross would be active for the game in Jacksonville. Ross played Sunday for the first time since the second week of the season, getting in for six plays without touching the ball. The receiver has been slowed by offseason shoulder surgery and a sprained left knee. He has yet to catch a pass – he ran once and fumbled in his other appearance.